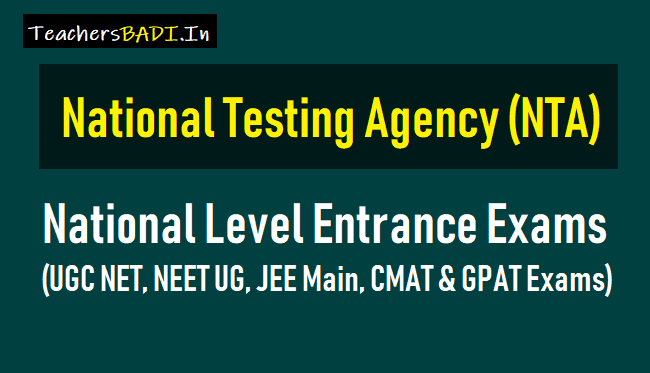 National Testing Agency (NTA) has been established as a premier, specialist, autonomous and self-sustainedtesting organization to conduct entrance examinations for admission/fellowship in higher educational institutions. To assess competence of candidates for admissions and recruitment has always been a challenge in terms of matching with research based international standards, efficiency, transparency and error free delivery. The National Testing Agency is entrusted to address all such issues using best in every field, from test preparation, to test delivery andto test marking. The right candidates joining best institutions will give India her demographic dividend. To improve equity and quality in education by administering research based valid, reliable, efficient, transparent, fair and international level assessments. The best subject matter experts, psychometricians and IT delivery and security professionals will ensure that the current gaps in existing assessment systems are properly identified and bridged. 1. To conduct efficient, transparent and international standards tests in order to assess the competency of candidates for admission, and recruitment purposes. 2. To undertake research on educational, professional and testing systems to identify gaps in the knowledge systems and take steps for bridging them. 3. To identify experts and institutions in setting examination questions. 4. To produce and disseminate information and research on education and professional development standards. 1. To identify partner institutions with adequate infrastructure from the existing schools and higher education institutions which would facilitate conduct of online examinations without adversely impacting their academic routine. 4. To help individual colleges and universities in the field of testing and to provide training and advisory services to the institutions in India. To provide quality testing services to the academic institutions in India. 5. To develop a state of the art culture of testing in India by using domestic and international expertise. To collaborate with international organizations like ETS to achieve the same. 6. To undertake any other examination that is entrusted to it by the Ministries/Departments of Government of India/State Governments. 7. To undertake the reforms and training of school boards as well as other bodies where the testing standards should be comparable with the entrance examinations. 1. The NTA would initially conduct those entrance examinations which are currently being conducted by the CBSE. 2. Other examinations will be taken up gradually after NTA is fully geared up. 3. The entrance examinations will be conducted in online mode at least twice a year, thereby giving adequate opportunity to candidates to bring out their best. 3. In order to serve the requirements of the rural students, it would locate the centres at sub-district/district level and as far as possible would undertake hands-on training to the students. 1. NTA will be chaired by an eminent educationist appointed by MHRD. 2. The CEO will be the Director General to be appointed by the Government. 3. There will be a Board of Governors comprising members from user institutions. 4. The Director General will be assisted by 9 verticals headed by academicians/ experts.